What defeats investors more than anything is psychology. Specifically, they can be undone by the emotional ups and downs that accompany the ups and downs of the market. For investors, it’s crucial that they understand how closely their emotions track the market, and how such emotions often lead them to do precisely the wrong thing. In an effort to help investors understand all this better, I offer the chart below, which links emotions to what’s happening in the market. By understanding the link, investors can see how emotions often short-circuit their investment plans by changing their focus from the longer term to the current moment. The cycle starts with confidence and moves through joy and exuberance. During this period, investors feel proud of their investment choices, enjoy being in a stock market where they are making money and have a strong desire to buy more. Investors love to share their success with everyone around them because they believe they could and should be managing everyone else’s investments. Finally, exuberance culminates in euphoria. In the euphoric stage the market looks unstoppable. Voices that counsel restraint are ignored while others with no expertise in business or finance freely give their opinion. The dot-com bubble of 2000 is an example of this stage of the cycle. Even very sophisticated investors became caught up in the euphoria. In 2000, venture capitalists invested more than twice as much as the previous year despite ballooning valuations, according to the National Venture Capital Association. More recently, just before the Great Recession, purchases of equity mutual funds accelerated as the market neared its highs. Euphoria encourages the maladaptive behavior of buying high. The mood changes when the stock market peaks and then starts to decline. At this stage doubt begins to take over. As investment losses continue for a longer period of time than expected, doubt grows to worry and then fear. “Could I be wrong?” enters the investor’s thoughts. Investors obsess on this question throughout their day as emotions play havoc with rational investment analysis. 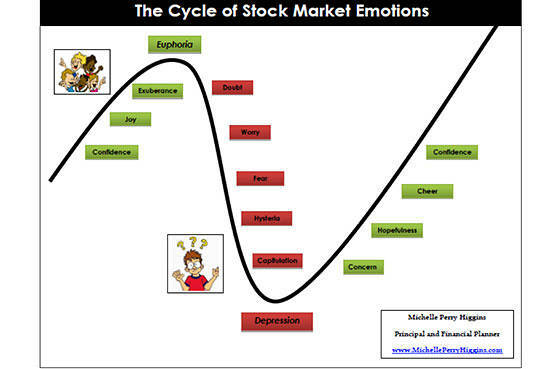 If investment losses continue to accumulate, the next stage of the emotional roller coaster is hysteria. Hysteria is a critical state because it is characterized by the most acute phase of short-term thinking when the grip of fear becomes so strong that long-term considerations are tossed aside. It is a well understood principle of behavioral finance that the pain of loss is greater than the pleasure of gain. If it is not arrested, hysteria can lead to capitulation, a state that is characterized by an overriding desire to end the pain of market loss. At this stage, the investor may call their adviser and yell, “Sell everything! I can’t take it anymore!” Very often, the investor sells at, or close to, the market bottom, just months before the market starts to retrace its path upward. After capitulation, the investor may enter a state of depression. There is emotional exhaustion and confusion about what just happened, and the realization that while short-term pain has been alleviated, the longer term is still uncertain. If the market turns up soon after the investor sells out, the depression may be exacerbated by the realization that the investor has committed the classic investment sin of selling low. Chastened by the whole experience, investors may become too paralyzed to buy while realizing it is too late to sell if they have not already done so. At the low point in the cycle there is no one left who will sell and very few brave enough to buy. This sets up conditions for a market recovery. Once this recovery is under way, investors feel a little better and start to focus their attention on how the market is doing. Their sense of depression turns to concern about whether the recovery is for real. As the market recovery gathers steam their concern begins to turn to hopefulness that it is for real and as the recovery accelerates they feel a sense of cheer and begin to dip their toes back into the market. When these initial baby steps are rewarded, cheer turns to confidence in continued market strength and the cycle begins again. So how can an investor short-circuit the cycle and its emotional impact on investment decisions? One way is to totally ignore the market cycle and the accompanying media noise except for periodic reviews during the year to review asset allocation to see if changes based on rebalancing or other considerations are appropriate. This is difficult, if not impossible, for many people. In that case the investor needs to keep reminding themselves to take a longer-term perspective.